We accept e-banking, ATM transfers, Cash on Delivery (COD) and Paypal. All prices on this site are in Singapore Dollar (SGD) and all transactions are only in Singapore Dollar (SGD) except in Paypal where Paypal will auto convert Singapore Dollar (SGD) to US Dollars. Customers can make over the counter payments or via cash deposit ATM machines at any DBS Bank branch available nationwide. 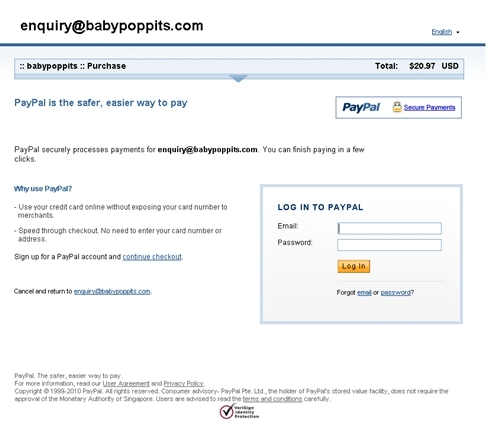 After payment is made, send notification email to singapore@babypoppits.com with the template below. Automatically your order will appear on the Paypal order & payment confirmation page. Paypal auto converts Thai Baht (THB) to US Dollar. Click Pay and Paypal will process your payment automatically.